It is really easy to take Renga Renga for granted - both in a practical and a visual sense. 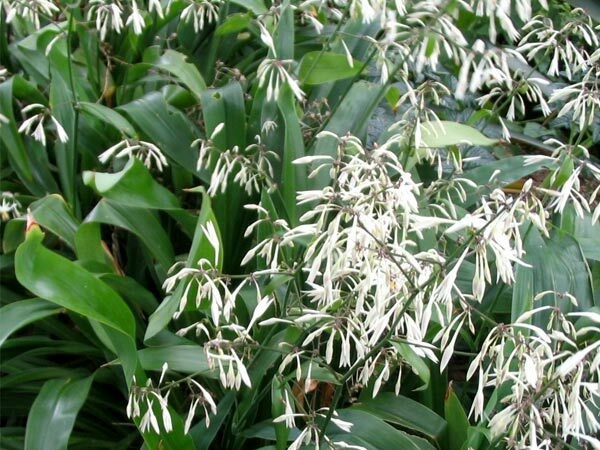 The strappy leaves are mid-green and the flowers in early summer are a subtle silvery white. I grow it in reasonably massed planting situations - it's like the perfect chorus for a garden opera! 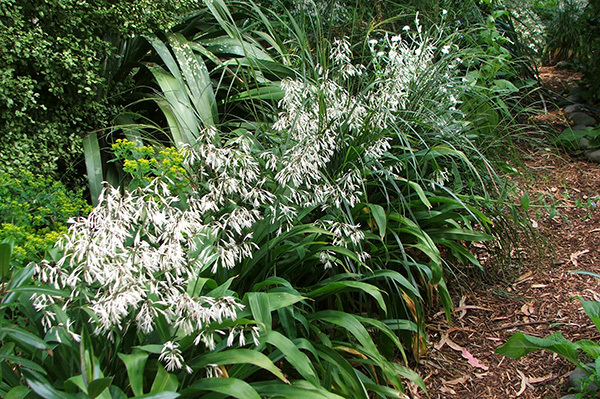 Renga Renga is oddly often overlooked when planning a New Zealand Native garden area. Renga Renga never crowds out nearby plants, and always retains its tidy look - particularly if grown in frost free sheltered areas. Here is the perfect plant for dry shade. Renga Renga even grows well underneath trees like gums and wattles (those greedy Australians!). It survives weather extremes - from snow storms in winter to drought in summer. 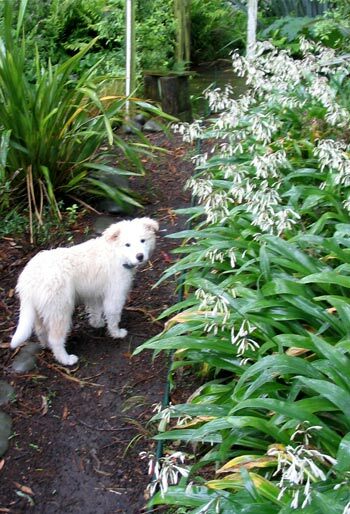 Many local gardeners refer to it as New Zealand's Agapanthus. The idea is that wherever Agapanthus will grow, Renga-Renga will grow and look better, being naturally native! Larger older clumps can be easily broken up to produce a mass of newer plants. There are also small seedlings to be collected and potted up. Thus a budget gardener can quickly mass-plant acres of land in Renga Renga and freely gain the admiration of New Zealand garden designers! In the Moosey garden Renga Renga is used a lot as a path edger (Moosey paths always have compulsory edging). One of the oldest established garden seats in the Wattle Woods sits surrounded by a sea of Renga Renga. What a plant legend! And to think that this is the first proper page to feature it.